Panetta Reassures Afghans On U.S. Training Role, Possibly Beyond 2014 : The Two-Way The bulk of the U.S. military force in Afghanistan is slated to leave the country by 2014. But the Pentagon is willing to keep some Americans there to train Afghan forces, according to a report by NPR's Tom Bowman. 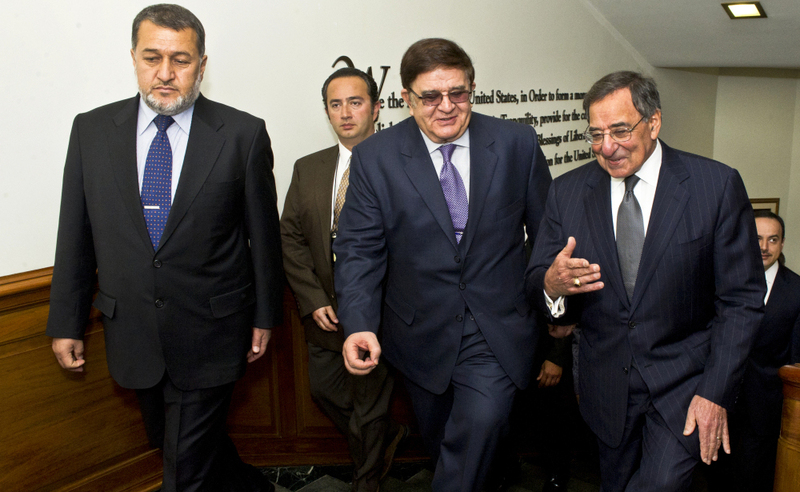 Secretary of Defense Leon E. Panetta, far right, escorts Afghanistan's Minister of National Defense Abdul Rahim Wardak (center) and Minister of Interior Gen. Bismillah Khan Mohammadi (left) in the Pentagon. "The U.S. already has spent billions of dollars doing just that. But Afghan interior minister Bismillah Khan, speaking through an interpreter, told reporters there are still gaps." "'We did receive assurances especially from the secretary of Defense that this training gap and this equipment gap will be filled,' Khan says. 'Again, he reiterated his commitment, particularly as we approach 2014 and past 2014.'" "A senior Defense official confirmed Panetta has indicated a willingness to help the Afghans." Panetta hosted Afghan officials in Washington Tuesday — an event that the Afghans reportedly used to urge the Pentagon not to leave their country entirely. Afghanistan is supposed to take full responsibility for its security after 2014. The news that America might extend its role in Afghanistan after it ends its current combat mission comes after several months of reports of attacks on international forces — including some that were carried out by Afghan soldiers. This past January, a member of Afghanistan's army killed four French soldiers who were in the country on a training mission — an event that led France to "suspend its training operations in Afghanistan and say it may withdraw all its forces from the country," as Mark wrote for The Two-Way. That incident coincided with a New York Times report on a rise in deadly attacks by Afghan soldiers on U.S. and international forces in Afghanistan. If it comes to pass, a sustained U.S. training effort in Afghanistan could mirror the approach to withdrawing American troops from Iraq, which was completed last December. According to a BBC report marking that event, "The only US military presence left in Iraq now is 157 soldiers responsible for training at the US embassy, as well as a small contingent of marines protecting the diplomatic mission."